Dr. Nanor is fellow of European Board of Otorhinolaryngology, head and neck surgery, an ENT surgeon with expertise in the general surgeries in the Ear, Nose, Throat. Dr. Nanor studied Medicine at Aleppo University and specialized in Ear Nose Throat, head and Neck Surgery at Aleppo University Hospital. Later She took her fellowship of European Board of Otorhinolaryngology and head and neck surgery. 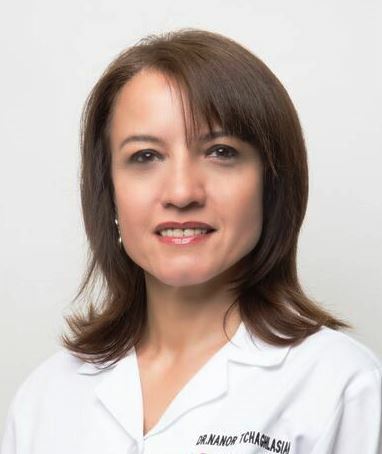 During Academic years She had special interest in hearing and balance disorders and she developed advanced experience in assessment and management of hearing and balance disorders from House Ear Institute, California and Royal Victoria Hospital, McGill University, Montreal. She has presented papers at National and International medical conferences. Her professional goal is always wellbeing of her patients. Dr.Nanor speaks Armenian (mother tongue), English, Arabic and Turkish.